The 2015-16 MEng and MEL NAME students at Seaspan Vancouver Shipyards. The University of British Columbia announced today that it will receive a $2 million investment from Seaspan Shipyards (Seaspan) over the next seven years to support innovative teaching and research in the naval architecture and marine engineering programs within UBC’s Faculty of Applied Science. As a result, two new UBC chair positions will be created, one in naval architecture and one in marine systems engineering, both of which are expected to be recruited this summer. UBC currently offers two professional graduate programs in Naval Architecture and Marine Engineering: a purely technical Master of Engineering (M.Eng) program, currently on its third cohort, and a business-oriented Master of Engineering Leadership (MEL) program, which accepted its first cohort in January. The Mechanical Engineering department has also offered a naval architecture specialization option within their undergraduate degree program since 1975. The Seaspan Chairs will provide the opportunity to expand UBC’s offerings in this area further to include research-based master’s and doctoral programs. The multi-million dollar investment is a result of Seaspan’s Value Proposition obligations under the National Shipbuilding Procurement Strategy (NSPS). As part of this agreement, Seaspan is committed to spending 0.5 per cent of each resulting NSPS contract to contribute to the development of a sustainable marine industry in Canada. In October 2011, the Government of Canada formed a partnership with Seaspan’s Vancouver Shipyards to build future state-of-the-art Non-Combat vessels for the Canadian Coast Guard and Royal Canadian Navy under the NSPS. 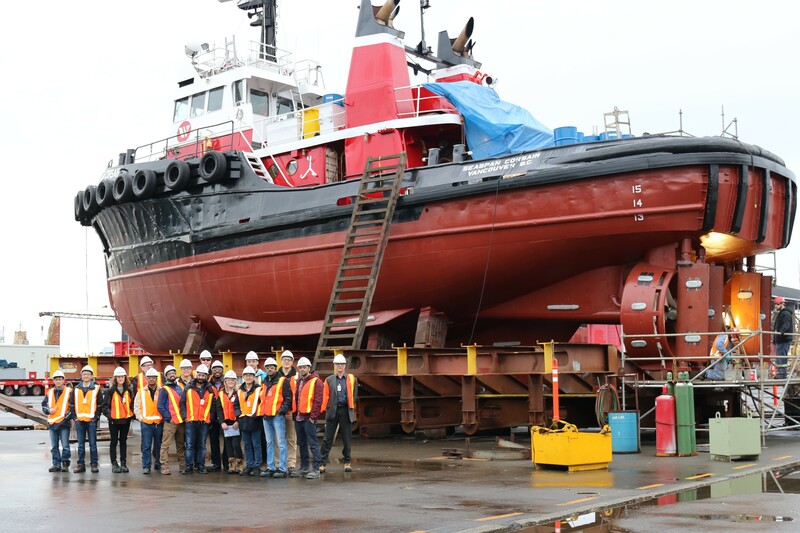 In response to this, UBC partnered with Seaspan and a number of other local marine companies to develop the Master of Engineering in Naval Architecture and Marine Engineering (M.Eng. NAME) program to train engineers in this field and thereby supply the workforce required to fulfill these contracts. Construction on Seaspan’s first NSPS vessel – the first of three Offshore Fisheries Science Vessels (OFSVs) for the Canadian Coast Guard – began on June 19, 2015. Work on the second and third OFSVs will commence in 2016. For more information about UBC’s naval architecture and marine engineering master’s programs, visit: name.engineering.ubc.ca and apscpp.ubc.ca. This story was recently featured in The Vancouver Sun and Journal of Commerce. Seaspan ULC is a group of Canadian companies (together referred to as “Seaspan”) primarily involved in coastal marine and deep-sea transportation, bunker fuelling, ship repair and shipbuilding services on the West Coast of North America. In addition to marine transportation services offered directly through Seaspan’s marine division, commercial ferry, shipyard and bunkering services are provided through subsidiaries including: Marine Petrobulk Limited Partnership, Seaspan Ferries Corporation, Vancouver Shipyards Company Ltd., Victoria Shipyards Company Ltd. and Vancouver Drydock Company Ltd.
Seaspan Shipyards, an affiliate of Seaspan ULC, is comprised of Vancouver Shipyards, Victoria Shipyards and Vancouver Drydock.